Calakmul Biosphere Reserve, the largest tropical forest reserve in Mexico spans more than 1.5 million acres in the heart of the Maya Forest. Near Calakmul just off Highway 186 at km marker 107, you’ll find a small parking area. From there, it’s a short walk along an easy trail to the bat cave overlook. Road sign near Calakmul Bat Cave, Mexico. 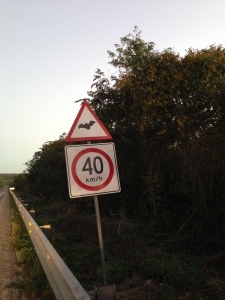 Drivers are encouraged to slow down at dusk as bats cross the highway. Starting at about an hour before dusk every day of the year, eight species of bats exit the cave to forage for insects in the night sky. The exact number of bats is unknown but estimates place the colony’s size at between two to five million bats. From a higher vantage point, the bats look like a highway above the forest canopy. When the bats first start to fly out, it’s just a trickle of bats here and there. It’s hard to imagine the spectacle that is going to form before your eyes over the next hour or so. You can see why locals call the cave “El Volcan de Los Murcielagos” or Bat Volcano. When the number of bats exiting the cave peaks, the mass swirls like a swirling eruption against the sky’s fading light. It’s a jaw-dropping wildlife spectacle! Contact us today for more information on Calakmul and the Yucatan Peninsula, Mexico. We’d be happy to put together a custom itinerary for you!